We now interrupt this week's posts to inform you of something seriously amazing. 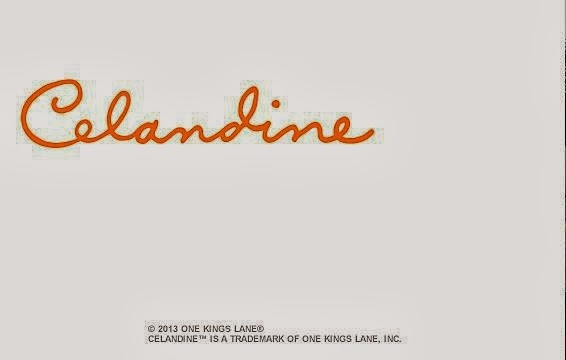 Last night, I was doing a little online window shopping and stumbled upon the new lines that One Kings Lane is featuring. Pay attention, little 'mingos, because this is a limited time thing. 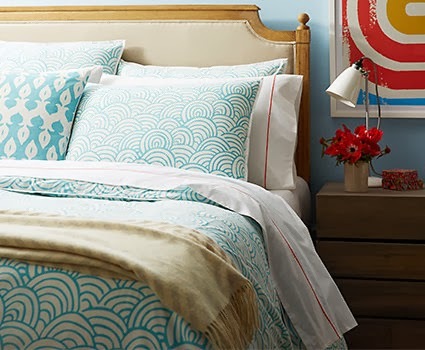 "Exclusively ours and crafted in collaboration with a few boutique mills and printers, this colorful, curated line of global-chic bed and bath accents was inspired by treasures from our travels. 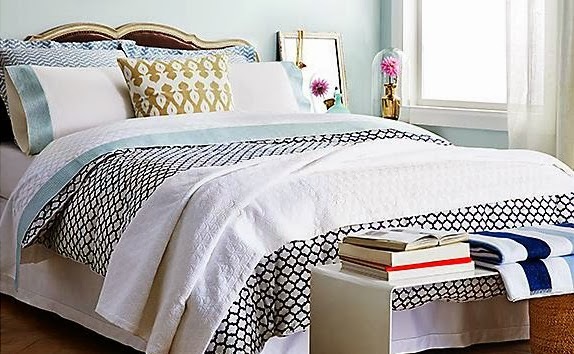 Think of it as dress-up for your home—an eclectic mix of modern twists on exoticmotifs: crisp sheets with artisanal details, rustic soft-washed quilts, tile-print throws, and towels with whipstitched edging, all sure tospice up any space." 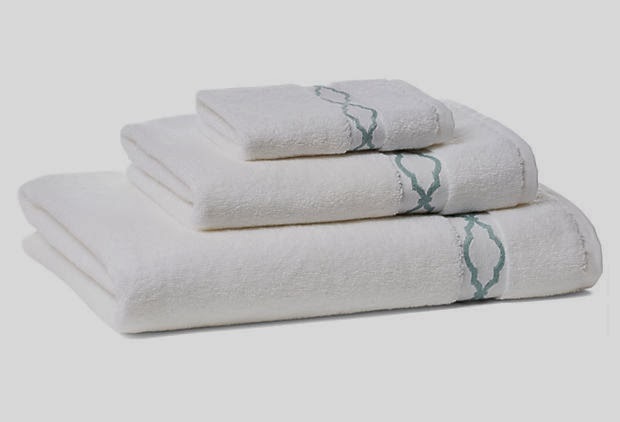 The Aegean Trellis Towel Set would look perfect in any bathroom. I would love two sets of these to hang on the towel bar. I love this teal color...I think it would look amazing with brass or gold hardware if you're willing to be a bit more daring. Exclusively from One Kings Lane, our debut line of bed and bath essentials brings together everything we love to create your sophisticated home oasis—deliciously crisp sheeting, ultrasoft matelassé and cable-knit coverlets, luxurious towels and plush spa robes that coordinate effortlessly. 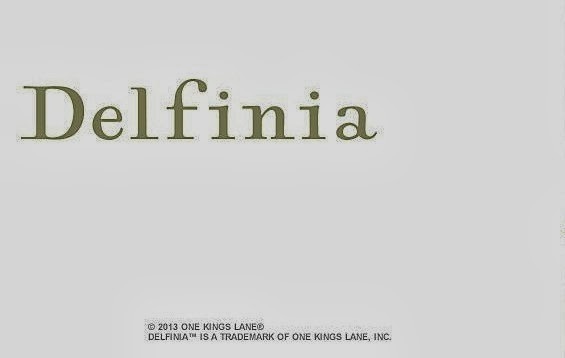 Elegant, understated, and always at ease, Delfinia epitomizes modern heirloom style. I'm in love with the Scalloped Duvet Set. The little touch of Navy is beyond precious. 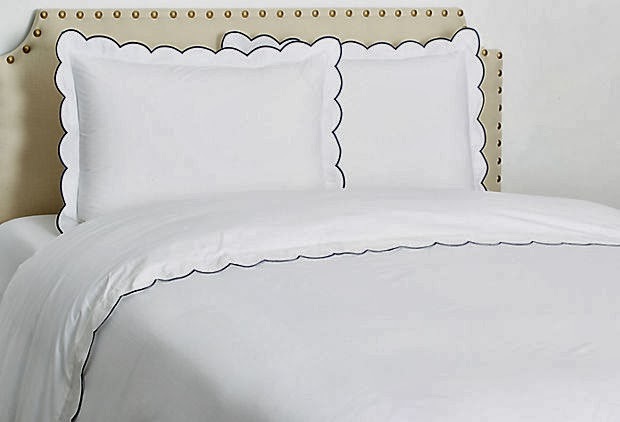 You all know I love white linens!! So tell me, which items do you love?